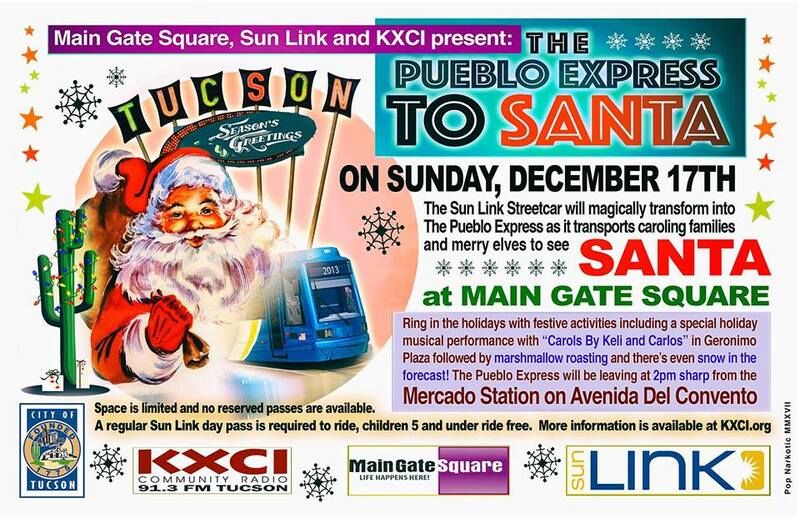 This is Tucson’s answer to The Polar Express, from Mercado San Agustin (out west of the I-10) into downtown, up 4th Avenue to Main Gate Square, just west of the UA. What fun with music (and elves) on board, and Santa at the end of the line. And I know that particular Santa, as I served with him on the ACLU of Arizona. Yes, even Santa cares about civil rights. Lots of kid -friendly activities at this Main Gate Sq. event: roasting marshmallows, creating luminarias, posting a wish on a Ben’s Bell tree, balloon hats (very clever reindeer ones), and of course sitting on Santa’s lap. We listened to some street musicians and watched the Saguaro Stompers tap dancing. And there was snow falling at Geronimo Plaza (white, foamy stuff which looked like snow, on this colder, drearier (and rainy) December day in the Old Pueblo.) Heard that the elves sang on the Pueblo Express which had arrived just before we did. Ongoing today till 5 p.m.